On Sundays this September, we're going to be marveling at some of the most important royal jewels in the world: crown jewels! First up: one of the most recognizable crowns in the world. Enjoy these images of the Imperial State Crown, glittering in motion! The current version of the Imperial State Crown dates to 1937, when jewelers overhauled and repaired the version that had been made for Queen Victoria in 1838. 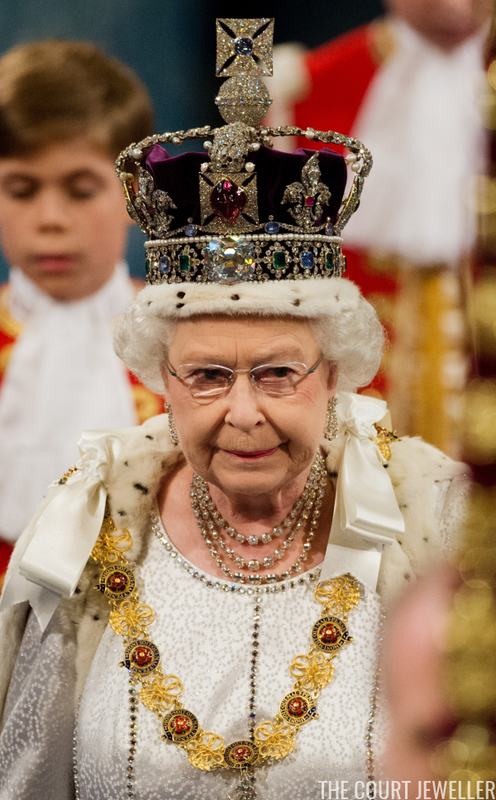 The crown was adjusted further in 1953 for its current wearer, Queen Elizabeth II. English and Scottish monarchs have been wearing various crowns for centuries, but the first version of the Imperial State Crown we're familiar with was made in 1660 for King Charles II after the Restoration. It's been made and remade nearly a dozen times since then. The crown is topped by a pair of crossed arches that meet at a monde and a cross pattée. The monde, which is the diamond encrusted ball, symbolizes the world ruled by the monarch. The top cross pattée on this crown has St. Edward's Sapphire set in its center. That sapphire is said to have been set in the coronation ring of King Edward the Confessor, which means that it would have been in the English royal collection since at least 1042. Three of the pearls that are suspended from the base of the monde are said to have belonged to Queen Elizabeth I. She was a famous collector and wearer of pearls, and they feature heavily in her portraits. The most important gem set in the crown is perhaps the Cullinan II Diamond, part of the great Cullinan stone that was unearthed in South Africa at the beginning of the 20th century. Often called the "Lesser Star of Africa," this diamond alone weighs 317 carats. Situated above the Cullinan II in another cross pattée is the Black Prince's Ruby. Actually a spinel, this cabochon gemstone has been in the English royal collection since 1367, when it was given to Edward, Prince of Wales ( who was nicknamed "the Black Prince") by King Peter of Castile. The Stuart Sapphire is set at the back of the crown; it was placed below the Black Prince's Ruby until the Cullinan was set in the crown. This 104-carat sapphire was may be one taken by King James II when he fled the country after the Glorious Revolution in 1688. An agent for King George IV later purchased the sapphire from a broker, who claimed it belonged to one of James's descendants, Cardinal York. Although the Imperial State Crown is not actually used to crown Britain's monarch -- that's the job of St. Edward's Crown -- this crown is probably more visible and familiar, as it is worn by the monarch at the annual state opening of parliament. When it's not being used, the crown resides with the rest of the British crown jewel collection in the Jewel House at the Tower of London.